With its quiet, well appointed interior and advanced technologies that bring extra confidence to the most challenging towing situations, the 2015 Silverado High Country HD has what it takes to make the tough jobs easier. Unique content includes a chrome grille with horizontal bars, and body color front and rear bumpers – including Chevrolet’s CornerStep rear bumper. All models include 6-inch tubular chrome assist steps, High Country badges on the doors and tailgate and High Country logos on the door sill plates. Silverado 2500HD High Country models also feature a unique 20-inch chrome wheel. Single-rear-wheel 3500HD models have an 18- inch chrome wheel, while dual-rear-wheel models use a 17-inch forged polished aluminum wheel. 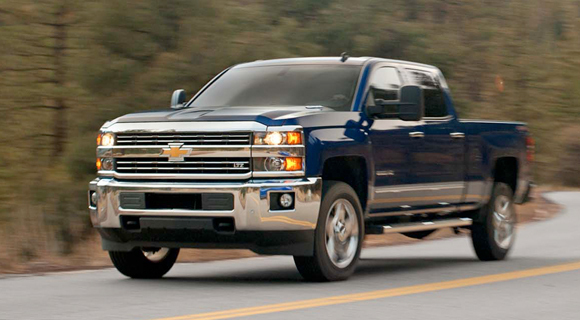 Also available on the Silverado HD High Country are Chevrolet’s new uplevel trailer tow mirrors. The chrome-capped mirrors manually extend for wider trailers and feature power adjust with memory and power fold. They include heat and turn signals in the glass. They also incorporate auxiliary clearance lamps and auxiliary cargo lamps to help make backing a trailer easier.